California’s forests, which represent some of the state’s most beautiful and valuable landscapes, are in a state of crisis due to overgrown conditions and escalating wildfires. These challenging conditions threaten not only rural communities where the state’s forests are located, but also suburban and urban areas that find themselves in the direct line of catastrophic wildfires. In addition to threats to life and property, critical assets for all Californians are at stake, including water supplies, wildlife habitat, clean air, and valued scenic and recreational amenities. The California Economic Summit, in advancing the Elevate Rural CA initiative, has identified forested areas as one of three key “solution spaces” for lifting up the economies and well-being of rural communities. The goal is to develop next-generation forest products that could lead to the removal and commercial use of excess woody materials now serving as fuel for fires. As a backdrop, it is important to understand that California’s forested areas are struggling with an unprecedented tree mortality epidemic. In the Central and Southern Sierra Nevada alone, 129 million trees died in just eight years. The crisis was born of a century-old policy of suppressing all fires, which created overcrowded tree conditions. The severe drought that gripped California between 2012 and 2016 reduced available water for trees and left them vulnerable to disease and insects. A widespread bark beetle infestation contributed to the massive tree die-off. Escalating wildfires are a highly visible indicator of the unhealthy conditions in forests. But even more is at stake. California’s forested lands play a critical role in the state’s overall environmental, social and economic well-being. California’s forested areas are home to national and state parks, recreational assets, tribal lands, alpine lakes, rivers and streams, valuable stands of trees, and a treasure chest of wildlife and habitat including important fisheries. Importantly, the vast majority of all water used by urban California and the state’s agricultural lands comes from watersheds found in rural forested areas. Wildfires pose a major threat to the sustainability and health of such headwaters and their tributaries by reducing tree canopies that preserve the snowpack, increasing soil damage and discharge of sediments, and reducing water available for groundwater recharge and storage. Warming temperatures from a changing climate are another increasing challenge. Additionally, forests play an important role in regulating levels of atmospheric carbon on a wide-scale basis. Forest overgrowth and wildfires threaten this balancing act, both on a short-term and long-term basis. Forest restoration, which involves both mechanical thinning and removal of woody materials and the strategic use of fire, is critical to forest health and maintaining water supply reliability and quality. Many efforts, including public-private partnerships, task forces, and legislative developments, are under way to promote restoration and resiliency in forests, including making greater use of excess woody materials. As the Elevate Rural CA initiative recognizes, new strategies must be pursued to develop viable commercial uses for low-value woody materials from forests. 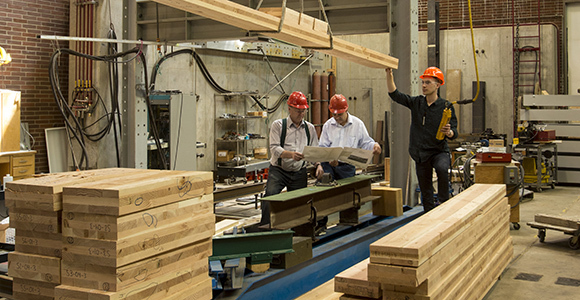 One promising market area involves mass timber, including an engineered wood product known as cross-laminated timber, which can be used in building construction. Currently, California has a housing shortage that is expected to reach 3.5 million homes by 2025. At the same time, although the state has massive forests and is the largest user of engineered wood west of the Mississippi, California imports from out of state nearly all of the engineered wood that it uses. The Elevate Rural CA initiative views development of an innovative and profitable wood products industry within California as a promising means of creating healthier forests and watersheds, providing greater public safety, and generating new jobs and economic growth. These forest resiliency objectives, along with goals aimed at strengthening water infrastructure and broadband access in rural areas, will be addressed among civic, industry and community leaders at the 2018 California Economic Summit on November 15-16 in Santa Rosa. These efforts align with the Summit’s objectives around the triple bottom line – economy, environment, and equity – and can benefit both rural and urban areas.